If you’ve found yourself in the middle of an extremely negative conversation with your friends, family members, or perhaps your doctor (after mentioning that you use fertility awareness for birth control) let me reassure you that you’re not alone. The reality is that even though the fertility awareness method is a scientifically proven and highly effective method of birth control, most people have either never heard of it before or honestly don’t really know what it is. Although the fertility awareness method is basically the complete opposite of the rhythm method, as far as most people are concerned they’re basically the same thing. What this means for you is that you know way more about it than everyone else. Although at first glance it seems like it would be nice to “know more” about how something really works, it puts you in an extremely difficult position; especially when it comes the the fertility awareness method. First, it’s none of anyone’s business. You don’t owe anyone an explanation for how you manage your fertility. You don’t need anyone’s permission, blessing, or acceptance. You’re an adult, it’s your body, and thus, your decision. End of story. The second key point is that sometimes it’s just not worth it. You’ll soon discover who in your life is genuinely interested and supportive. Those folks are the audience to share with. When you encounter people who aren’t supportive…even if those people are your close friends and family, having a back up answer like “we’re using condoms” can save you hours of unnecessary discouragement and aggravation. One of the reasons that I’m so passionate about helping women to connect with their bodies and their fertility is because fertility awareness provides a wealth of information about your body that you wouldn’t have otherwise. Your menstrual cycle is the 5th Vital Sign of your health and vitality. That means you can use your menstrual cycle as a tool to monitor your health. When you chart your cycles with fertility awareness your charts become an early warning system alerting you immediately to possible fertility issues, endocrine disorders, and menstrual cycle concerns. I’ve personally worked with clients who, through their charting, were able to discover thyroid conditions, PCOS symptoms, nutrient deficiencies, hormonal imbalances, and identify their luteal phase defect. If you focus more on the health benefits of charting this could garner you more support for your decision to use fertility awareness. Who can tell you that you’re wrong for wanting to improve your health? This may not be enough to “convince someone”, but in reality, you’re not going to “convince anyone” anyways. Before I get into this section the caveat here is that you’re not going to change anyone’s mind in one conversation. No one likes to be “wrong” and I’ve met precious few people that aren’t invested in whatever it is that they believe. With that said, if you’re ready to jump into an all out “battle” then when you get the “there’s no scientific research to back up what you’re saying” and “everyone knows the rhythm method doesn’t work” then you can load them up with the science. For those who argue that it isn’t an effective birth control method, scientific research has been done in this area showing that when used perfectly, fertility awareness is 99.6% effective in preventing pregnancy. But even if you bring a horse to water you can’t make her drink. Kind of like making dinner for a toddler – can’t make her eat it either. You can have the most carefully crafted arguments with the most accurate and verifiable peer reviewed studies, but that doesn’t mean the person talking to you will change their mind. You might find that the harder you dig your heels in and argue your points the more firmly your chatting buddy will support their counter points. I discovered fertility awareness in the year 2000, so for me I’ve had 17 years to marinate on this. I know where I stand, and I also know that it works. If you find that it really gets under your skin when someone challenges you about it or tries to convince you that you’ve made the wrong choice, perhaps it’s only bothering you because you’re not as comfortable in your own understanding as you thought you were. Perhaps you know the research is out there but you’ve never explored it for yourself, or perhaps there is a part of you that doesn’t fully trust the method because there are still aspects of it that you don’t understand fully. Now I want to hear from you! 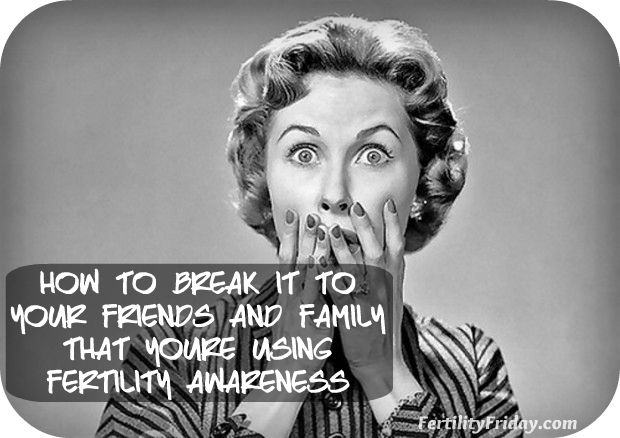 Have you had a negative experience sharing that you use fertility awareness with someone in your life? Do you disagree or feel that lying and saying you use condoms is a cop out? I’d love to hear your thoughts in the comments below! You’re saying it’s the 5th vital sign of vitality and health. I totally agree, only wondering what the other 4 are. Aaah respiration… didn’t think about that! Thank you. By the way, I can open the links in the blog. Thanks for writing this! I’ve had quite a few experiences telling friends and family and realized quickly that I need to craft the news better. I find that Women my age (late 20’s, early 30’s) are interested and excited to learn about it, as many have had negative effects from the pill and have been on the pill for longer than a decade. I am still using condoms during my fertile period, so I feel OK using that as my back-up argument! My mom (68) took the news skeptically at first, but has an open mind and let me rattle off all the info to her, and she trusts me to be responsible. My sister (48) also took it skeptically; though when I asked her what she did after going off the pill she told me, you guessed it…condoms! The worst experience was my Aunt. She is in her 50’s and had trouble conceiving my cousin when she was in her 30’s. She simultaneously told me to be ‘very, very careful’ about getting pregnant (implying that it’s easy to do) while telling me it was so hard to get pregnant (because she had a difficult time) After learning FAM, this explanation seemed illogical and hypocritical. I’m learning that going around telling everyone isn’t the best idea – but I’d still love to share this information who may find it valuable.